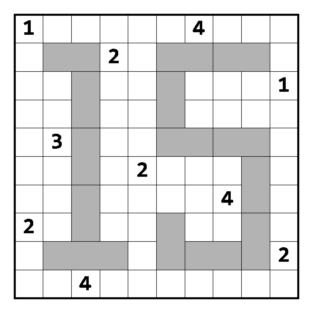 Rules: Fill the grid with digits from 1 to 4. 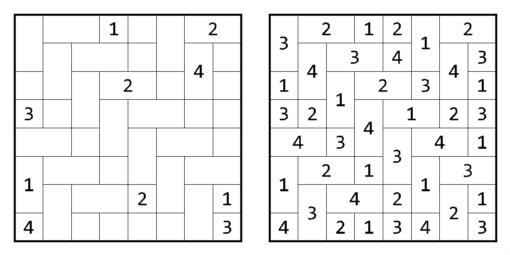 Same digits cannot touch each other, not even diagonally. Background: This one was invented by Vladimir Portugalov. He introduced so many new and challenging puzzle types to puzzle culture so far. He had worked hard in puzzle area, he organized so many championships like 17th WPC, or Belarus Open Puzzle Championships etc. Different Neigbours is as famous as Kropki. So it appeared in many championships, starting from 2006. Actually I met this type in 15th WPC-Bulgaria, Welcome part. That part was prepared by Vladimir. You can see the 15th WPC Different Neighbours. 2 years later, Different Neigbours showed up again in a WPC. Giant part of 17th WPC-Minsk, had several big puzzles. Here is the 17×17 D.N. from 17th WPC. Actually you can find so many Different N. on the web. Vladimir published Forsmarts Books from time to time. 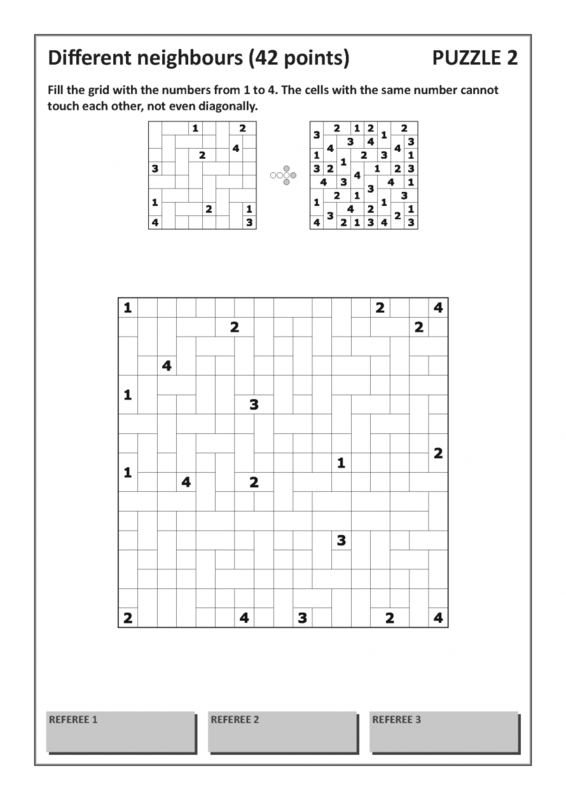 Forsmarts is a puzzle web page built by Vladimir. He published nine books so far. Book 1, 4 and 8 include that puzzle type. Also LMI’s Puzzle Marathon 2012 had a big one. This one also had a video by rob. Bu yazı Instructions içinde yayınlandı ve Aksiyon, Different Neighbours, Forsmarts, LMI, puzzle, WPC olarak etiketlendi. Kalıcı bağlantıyı yer imlerinize ekleyin.